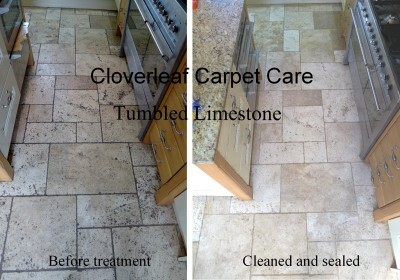 Travertine and limestone floor tile cleaning service Cheshire. Areas regions covered for Limestone & Travertine floor cleaning include: Alderley Edge, Altrincham, Congleton, Chester, Crewe, Nantwich, Frodsham, Hale, Holmes Chapel, Knutsford, Lymm, Middlewich, Northwich, Sandbach, Tarporley, Winsford, Warrington and Wilmslow. 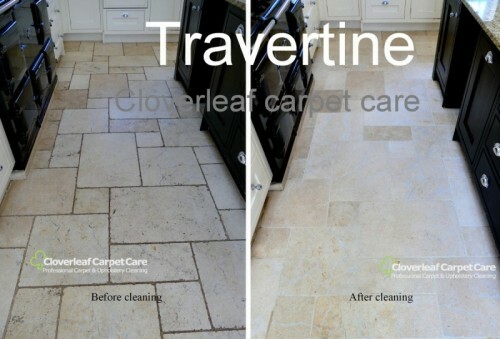 Our Company provides a Travertine and Limestone Floor Cleaning service in the Cheshire area. Travertine floor tiles can come in many and varied shades of beige, including cream colours or darker shades. Additionally patterns and veins from fossils and plants and also holes created from gas bubbles during the rocks formation can often be evident on the surface. As Travertine stone is somewhat porous, it will readily attract grease and grime soiling caused by foot traffic coming into the property. Where there are homes with animals such as dogs living, the soiling may be more evident. Periodic and professional maintenance with machine cleaning should keep your Travertine floor including the grout in good as new condition. Limestone floor tiles are very similar to Travertine but this type of stone is denser, smoother, somewhat softer and less porous. Limestone rock flooring tiles also come in various surface textures and colour shades. Additionally the edges can be straight and sometimes scalloped where they fit next to the grout. Similarly this type of tile will require cleaning at periodic intervals to keep both the grout and surface looking bright and clean. If you require a friendly free no obligation assessment and quote for your Limestone or Travertine flooring in Cheshire, please get in touch. We can visit your property to see what your requirements are and leave you with a quote for your consideration. Travertine floor cleaned and sealed in Cheshire. In the image below is a Travertine floor in Knutsford Cheshire that required cleaning after many years of use. The floor had a build up of dirt and grime which could not be mopped clean. The grout also required cleaning as it had turned black. The floor was machine cleaned using a light abrasive which brought the floor to as new condition. The floor was then sealed to help prevent stains from both water and oil based spillages using Lithofin Stain Stop Eco. 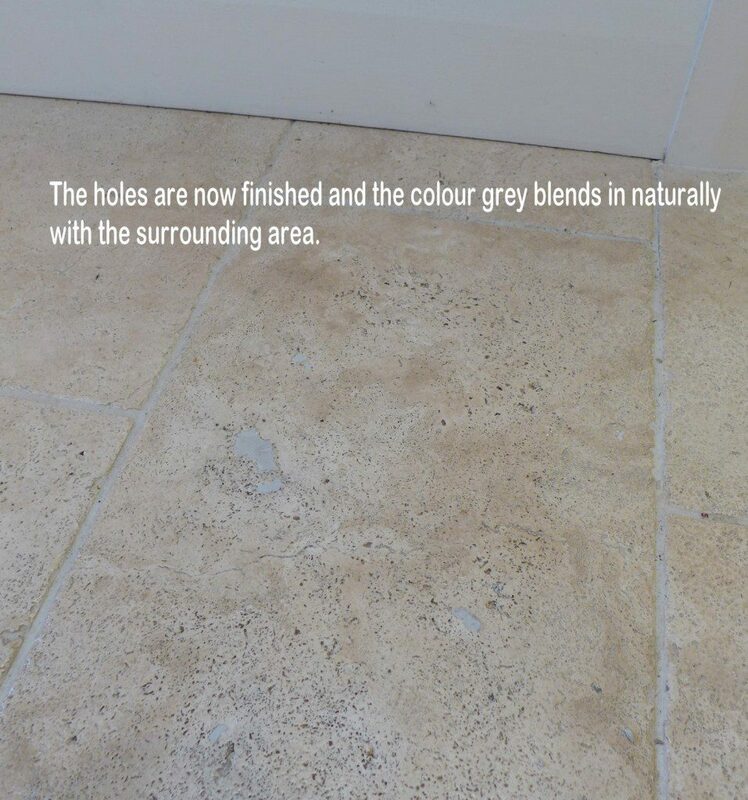 The grout or the joints between the Travertine tiles were also brought back the their original colour white. Needless to say, the client was delighted with having her grubby and drab floor looking like new again! Also below is an image from the same property around the kitchen area showing where the Travertine tiles had been cleaned and sealed. Honed Limestine floor cleaned and sealed in Cheshire. Below is a Honed limestone floor in Alderley Edge Cheshire which was cleaned and sealed during March 2015. This was part of a hallway, WC and utility room in a barn conversion. The floor being some 10 years old had become somewhat discoloured and also the grout was in need of cleaning. The limestone floor was then sealed with Lithofin Stain Stop. Click image to enlarge. Tumbled Limestone Floor Tiles Cleaned and Sealed in Cheshire. 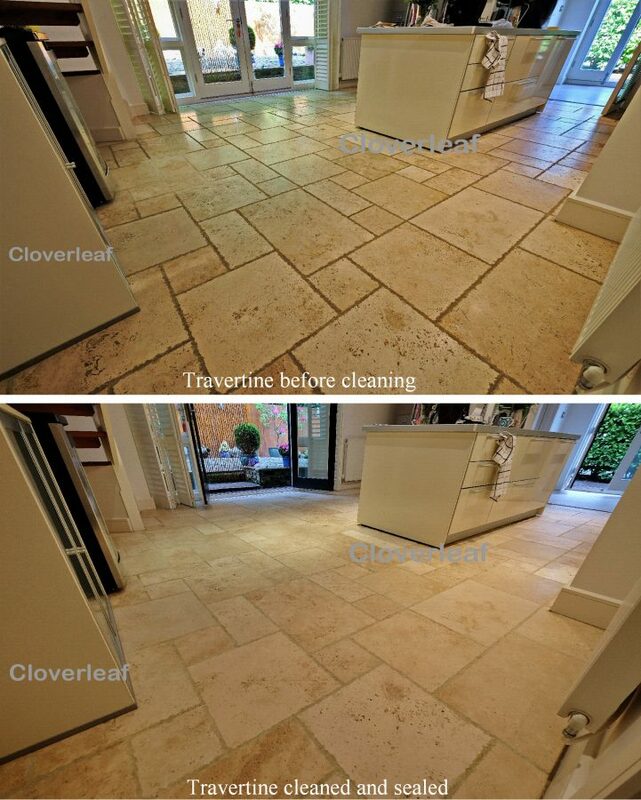 Below is an image of a Tumbled Limestone Floor before and after cleaning in Mobberley Cheshire during March 2015. The image is part of kitchen area. The client was disappointed with the floor which had become dark and grubby due to having lots of through traffic including Labrador’s. In particular, the grout had become darkened and discoloured. The floor was machine cleaned bringing it back to it’s original appearance looking as good as the day it was laid. The abrasive cleaning process removes a slight amount of stone leaving it bright and smooth. The floor was sealed using Lithofin Stain Stop which will reduce it’s absorbancy thus helping to prevent any staining due to spillages. Travertine Floor Tiles Cleaned and Sealed in Cheshire. Another example of how Travertine floor tiles were cleaned. The grout or the lines between the floor tiles have also been cleaned and look as new again. Travertine floor cleaned in Cheshire. Below is a Travertine floor cleaned and sealed in Frodsham Cheshire. The floor is situated in a kitchen and area and the client was delighted with her newly restored floor. A Limestone floor cleaned and sealed near Knutsford Cheshire. Below is a Limestone floor which had been laid some 7 years ago. It had become quite soiled in a high traffic kitchen area. Despite regular mopping and cleaning, the floor had started to absorb grime and had lost it’s original appearance. The floor belonged to a long term client in Lower Peover. The floor was stripped clean and sealed with Lithofin Mn Stain Stop as this floor was highly absorbent and needed proper protection. 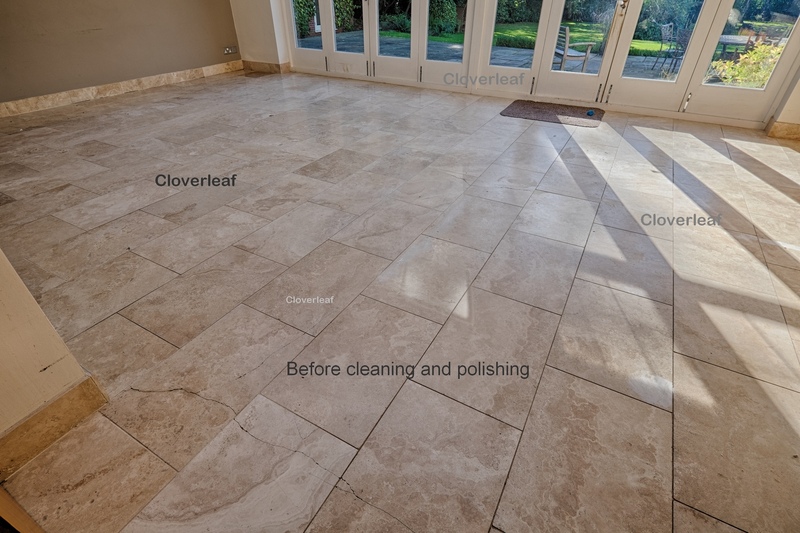 As can bee seen from the images below, this is a lovely beveled edge Limestone floor and cleaning has brought it back to it’s original appearance revealing the lovey lines and colours. Limestone floors can often benefit from being polished. This process involves filling any holes and cracks where possible and cleaning the whole area including the grout lines. This is followed by honing the floor with diamond abrasives and polishing compound to obtain either a satin sheen or a more reflective finish. This process lightens the colour by several shades and also greatly enhances the patterns and colours as seen in the example below. 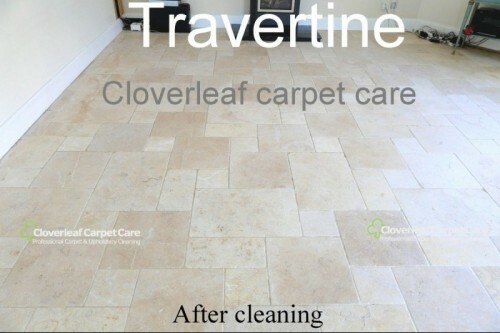 Opposite is a video which is a typical example of how your Travertine or Limestone floor can be cleaned. Set your control (wheel) to HD for a better picture. 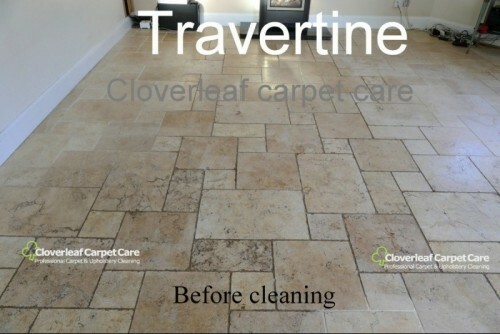 Travertine and Limestone floor cleaning will normally restore your floor to as good a condition as the day it was laid. Once cleaned, the floor may be porous and we can advise you if the surface requires sealing. There are many different types of floor sealer on the market which can become confusing. Most popular is Lithofin MN Stain Stop which is a clear impregnating solvent based floor sealer that will help prevent staining to Limestone and Travertine floors. This type of sealer will not alter the natural look of the floors surface. More recently, water based sealers have been developed which can be just as effective as solvent sealers without the unpleasant odour or health hazards of solvents. Lithofin Stain Stop Eco is a premium, no-sheen, natural look, water-based, penetrating sealer is also formulated to provide maximum stain protection. Below is a video which is a typical example of how your Travertine or Limestone floor can be cleaned. Set your control (wheel) to HD for a better picture. 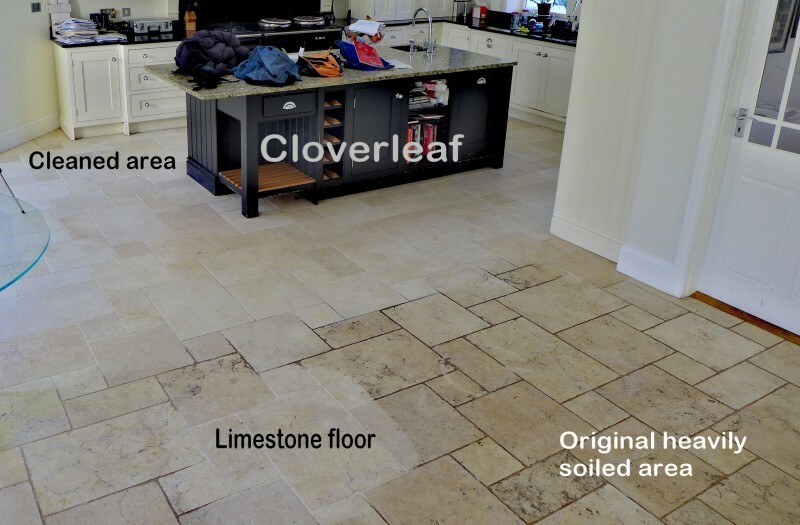 Frequently asked questions about Limestone and Travertine floors. What causes my Limestone or Travertine floor to become discoloured or dirty? Most Limestone and Travertine floors are somewhat porous and over the course of time, everyday cleaning chemicals and grime build up adhere to the surface which can be virtually impossible to remove either by mopping or scrubbing. This results in the floor loosing it’s original appearance and becoming many shades darker. Also for example Limestone which is pale cream in colour such as Apple stone can become slightly yellowed due to build up. The only remedy is to have the floor professionally cleaned at regular intervals to maintain it’s appearance. Many of our clients are unaware when they have this type of floor installed that it needs to cleaned and perhaps re-sealed periodically. Can you remove the stains, dull marks from spillages and scratches from my floor? Many stains can be caused by spillages such as wine, soft drinks and tea or coffee. Sometimes if the stains have gone deep into the stone they can be permanent. However on shallow stains these can sometimes be removed during the cleaning process. These are normally caused by acid from the spillage etching the stone. 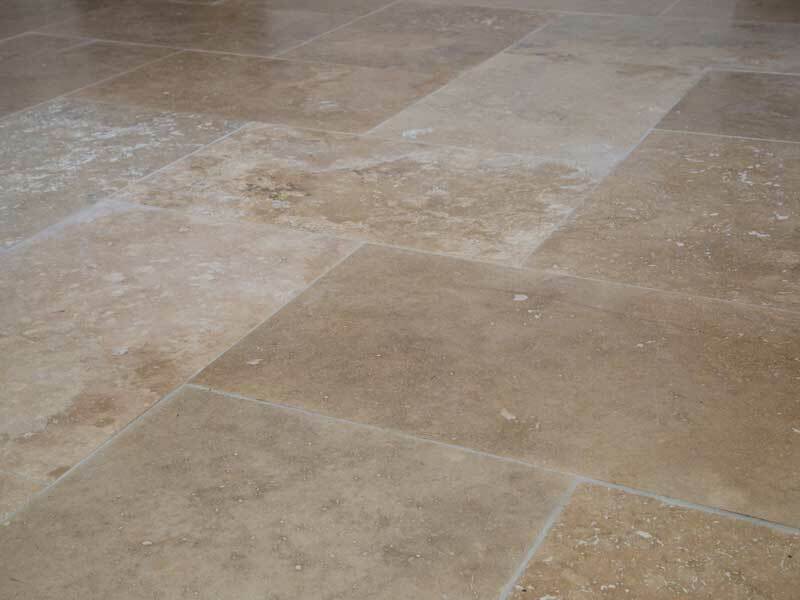 Both Travertine and Limestone are calcium based which means they are sensitive to any acid contained in the spillage. The acid eats away at the surface creating a dull area. Mostly this can be removed with honing using diamond additives during the cleaning process. Heavy scratches from furniture may be impossible to remove due to the amount of stone that needs to be removed. However once the floor is cleaned they may be difficult to see or less evident. Light scratching or general dullness and wear and tear, can be removed or minimized with honing. A general cleaning of the floor can clean out scratches where the dirt has settled and be brought to acceptable condition with out the need of honing. Both Limestone and Travertine are soft materials, so slight scratching due to foot traffic is quite normal. Does my floor need re-sealing once it's cleaned? We clean many Travertine & Limestone floors floors on a regular basis and due to the regular cleaning schedule and good housekeeping, eg no spillages between cleaning, we find many floors may not need re-sealing as it may not be cost effective under those circumstances. However, where we find a well used floor which has suffered from stains and needs re-honing we would recommend the floor to be re-sealed. In well used areas such as bathrooms and kitchens we would recommend these areas to be sealed at least every 3 years. When we asses your floor, we can recommend whether it would be beneficial to have it sealed and the most cost effective way to go about it. Can you restore the shine to my Limestone floor? 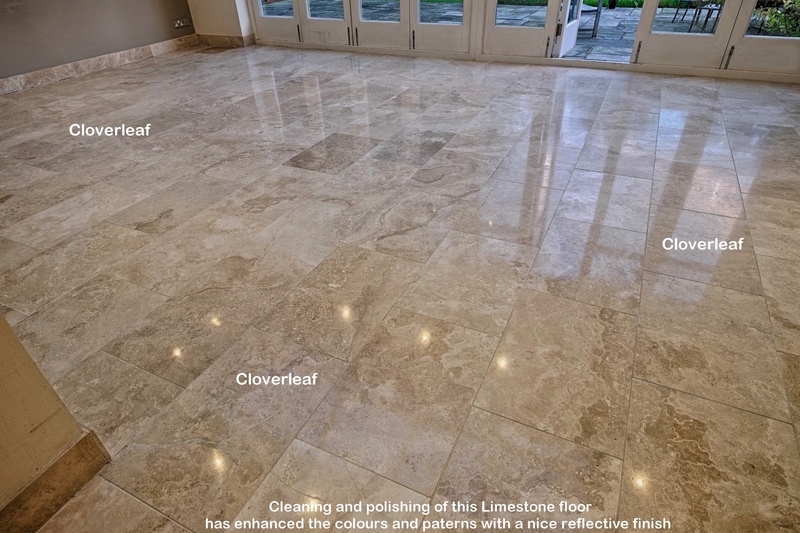 A Limestone floor will often lose the shine and reflective finish due to wear and tear. In most cases the floor can be restored to a high shine finsh using diamond abrasives and polishing techniques and the results can be amazing. The new shine and lustre will also bring back the rich colours of the stone. In some cases it may not be possible to remove certain types of surface scratches but once the floor is newly polished they are often hardly noticable. 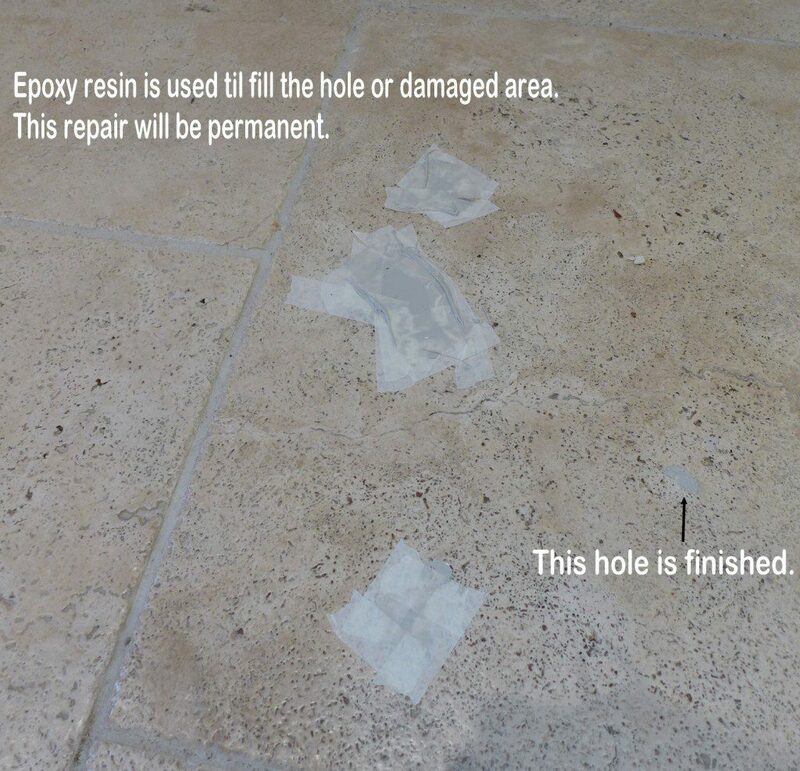 Can you fill or repair the holes in my travertine floor? Travertine floor tiles are formed naturally by mineral springs and it is a sedimentary rock. Therefore there may be minor imperfections in the surface. Any unsightly or obvious holes are usually filled in during manufacture. However the holes that were filled during manufacture could pop out due to ware and tare. Additionally some holes may appear during the life of the tile due to a hole just under a thin section of surface that has worn through. 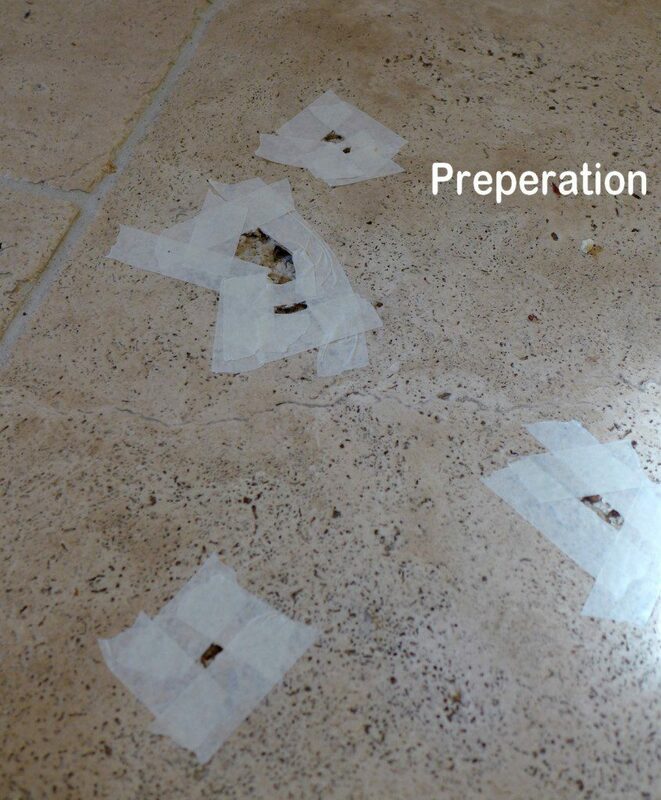 Any unsightly holes can be filled in with an extremely durable epoxy resin similar to the colour of the floor tile which is usually a permanent repair. There can be variations in a floor colour, from a a very light straw colour to a floor which has aged and shows a patina, either yellowing, darkening or browning. The change in colour can be caused by oxidization due to iron being present in the stone which is irreversible. The colour of filler can usually be mixed to blend in with the surrounding area. Quite often due to the variation in colour, it is best to mix a light grey which will usually blend in with the area as shown below. The epoxy resin used is Tenax floor filler specially developed for use on Travertine floors. 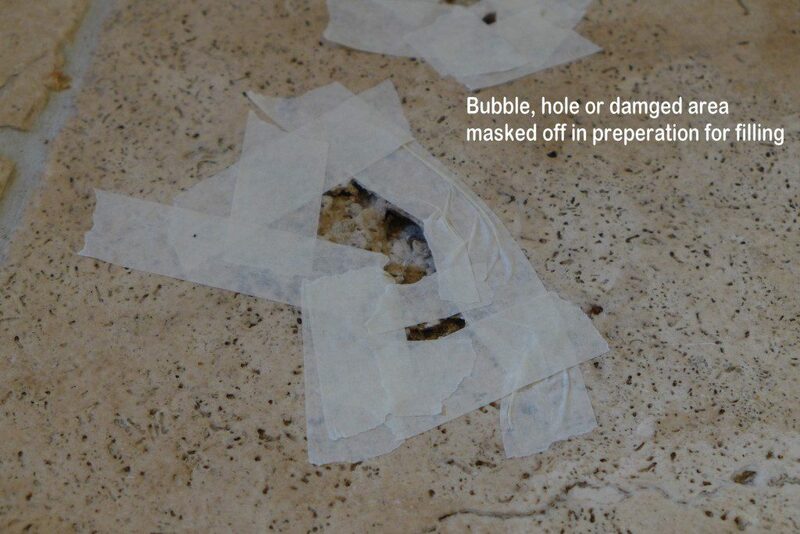 Read more here how holes in Travertine floors are filled and repaired. How will my floor look once it's cleaned? Your floor should look totally different once it has been cleaned, much brighter and with the grout brought back to it’s original colour. Many of the Travertine or Limestone floors that we clean look like nearly new or as good as the day they were laid depending of the age of the floor of course. Other factors to take into consideration are perhaps deep stains or damage which may not be able to be removed. We can also carry out a test patch area during a free no obligation quote to see if you are happy with the results before you go ahead.